Those Iranian cities that happen to lie on the margins of the deserts - and some even within them - face intense heat in summer and biting cold in winter and serious fluctuations in temperature at all times. Dry winds that carry dust make things worse. To provide suitable homes, buildings must be made following certain principles which the local people of the past had discovered by common sense, experience or deep perception. This article attempts to survey the traditional architecture as found in one such typical city, Zovareh, in the Ardestan region of Isfahan Province. 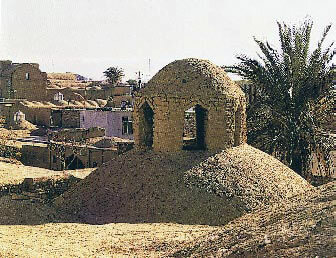 Zovareh is a small town, on the outskirts of the Great Desert, that faces severely harsh weather. Sandstorms and droughts are common place as is harsh winters and heavy snowfalls. In summer the temperature is often above 45°C and in winter 9° below freezing point. There is icy weather during three months with biting winds from the west. In summer the sandstorms are hot like air escaping from the baker's oven. Only the so called Khorassan winds from northeast and qibla winds from the south bring a little comfort. In such almost intolerable conditions human life sounds almost impossible yet we witness the existence of a town with a long history. How has it survived? In fact it is one of many the inhabitants of which have cunningly overcome the harsh climate by building homes that make life possible despite the heat and the cold. The first point the people of the desert region in Iran have noticed is the intensive heat of the sun reflected from the earth of the desert. Therefore they have surrounded their city with a belt of trees and gardens. The second important point is the alignment/direction in which the buildings should be built. The city looks towards the direction of northeast and southwest from where cooler winds blow. The third principle is that buildings, like human beings, are more effective if they are untied. 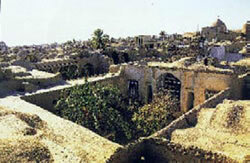 Therefore, the houses and buildings in Zovareh are built compactly one house immediately adjacent to the next, with narrow streets passing like grooves and small courtyards surrounded on almost all sides. Fourth, to protect the pedestrians moving from one point to another most streets are roofed. The roof shields sunlight from reaching pedestrians and the large difference between the temperatures of shaded and unshaded areas causes a cool current of air to flow from the shades to the sunny areas. This current cools passersby who would not be able to bear the heat on unshaded streets. Fifth, the courtyards, tightly surrounded by buildings act as wells preserving the coolness of the night for daytime. The sixth point is the coolness that evaporation provides. Every home in Zovareh has a small pool and a fountain. The warm air causes the water - especially sprays from fountains - to evaporate and thus lowers the temperature. The seventh point is an invention: some sort of ventilator that is made up of two tunnels crossing at right angles with the ventilator heads, above. It draws in cool air and forces out warm air. Another brilliant architectural feature of Zovareh's buildings, the eighth point, is that the rooms face different directions. Some rooms are built facing southeast to collect most heat from the sun in winter. Some rooms face northeast and have the sun's heat at the rear but these are unbearably cold in winter. No room is built facing northwest because they would be unusable in winter or summer. Furthermore, the roof of the summer section of the buildings extends forward creating a porch like space in front of the windows and preventing sunlight from entering the rooms directly through the windows. So rooms are used in winter or summer depending on whether they face the sun most of the time or have their backs to the sun. The ninth point is building homes of thick brick walls to keep in the warmth in winter and keep out the heat in summer. High ceilings mean that there is a greater volume of air in the room which stops rapid heating or cooling of the space within. The desert offers cool nights and therefore sleeping on the roof of the house at nights is a blessing. Finally, to escape from the hottest hours of the day, the inhabitants use underground space and spend these hours in cool, moist cellars. These clever steps have allowed the people of Zovareh to live in such difficult climatic conditions for over 1,000 years.